Preface/Authors’ Stories – Trust the Loving Universe! How do we, the authors, know the stuff that we know? 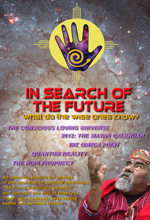 This book, which is intended to trigger the reader’s own inner knowing, presents a radical and unique world-view distilled from indigenous cosmology, quantum science and the world’s spiritual traditions, both Eastern and Western, as well as our combined personal life experience and intuition. Where did this synthesis come from? What were our greatest influences? Some years later, in a university anthropology course on comparative religion, I found part of the answer I was looking for, in the cosmology of the Australian aborigines. By that time I was a college lecturer in organic chemistry, and, thanks to my science training, had a vestigial idea of what quantum physics was about. Up until that moment, nothing in the mainstream religions had made much rational sense to me. They were obviously man-made constructs, all of them. The aborigines, however, were different. They spoke pure, poetic quantum science. Their take on the nature of the Universe resonated in me in ways that neither Western science nor world religion had ever done. Hitchhiking north on Highway 101 from Los Angeles for the very first time, I had a powerful experience of synchronicity. I was picked up in Santa Barbara by a man who introduced himself as Jeffrey Love. He was heading for Santa Cruz, but needed to make a stop along the way, if I didn’t mind. I had all the time in the world, I told him. The stop turned out to be the Esalen Institute on the cliffs of Big Sur. It was a glorious January day. On the winding curves of Highway One, high above the blue Pacific, Jeff asked me what I was planning to do in Santa Cruz. I mentioned my London encounter with Ralph Abraham. “Aha!” he exclaimed. Ralph and Jeff, it turned out, were partners with an Indian master musician in an educational venture called the Pataal Foundation. Pataal means “navel” in Sanskrit, Jeff explained. Planet Earth has two spiritual navels, or poles, one near Rishikesh in the foothills of the Himalayas, and the other in Santa Cruz, California, our destination later that same day. I had definitely entered another dimension. A lot was going on in Santa Cruz at the time. For example, a certain Richard Alpert, PhD, the controversial Harvard psychologist and LSD proponent, had parked his ‘67 Volvo in Ralph’s California Street driveway and gone off to India in search of enlightenment, as many spiritual seekers were doing at the time. Dr. Alpert returned with a new vocation and a new name: Baba Ram Dass. The nascent guru settled in Santa Cruz, the surfing capital of the world, and the rest is history. In another instance of synchronicity, Ram Dass set up shop in the rented house in the little village of Soquel that was my first home in America, shortly after I moved out and up into the Santa Cruz Mountains, and his Harvard psychedelic research colleague, Ralph Metzner, initiated me into the mysteries of an ancient meditation practice called agni yoga. I arrived in Northern California a few years too late for the Summer of Love, but my timing could not have been better. Looking back, I can see that I had landed right in the center of things at the perfect moment. I was a competent athlete and an intellectual graduate student at that time, but my spiritual ignorance was almost complete when I arrived in Santa Cruz. Ralph Abraham, [unbeknownst to him] helped launch me on a path which led to decades of inner work with the likes of Ralph Metzner, Stanislav Grof, Pir Vilayat Inayat Khan, and Persian mystic and sufi poet Javad Nurbhaksh. Further information and inspiration came from the wise ones: Paramahansa Yogananda, Aldous Huxley, Hazrat Inayat Khan, Teilhard de Chardin, Sri Aurobindo, Jalaluddin Rumi, Ervin Laszlo, Bruce Lipton, Rupert Sheldrake, Jean Houston, Brian Swimme, Barbara Marx Hubbard, the Kalahari Bushmen, the Toltec elder Tlakaelel, Victor Vernon Woolf, and others too numerous to mention. One and all, I bow to the divine in you, and humbly thank you for all you have given the world. Finally, I honor my beloved partner, Connie Baxter Marlow, whose extraordinary vision provided the inspiration and the backbone of this book. Growing up in Maine in a family of visionary philanthropists – governors, mayors, legislators and community leaders – I noticed that not everyone in the world lived according to the principles of generosity and love. As a teenager, I read about Florence Nightingale and knew in that moment that humanity has an astounding capacity for love. I realized that something was missing in our understanding, something that led us to create a world-out-of-balance. I set out to find the missing pieces of the paradigm. I went to Europe in 1968, after graduating from U.C. Berkeley with an honors degree in Economics, and disappointingly, found only the roots of the very mind-set that had created my own culture. In 1976, in a bookstore in Santa Fe, New Mexico, I picked up a book of poetry from a Native American perspective. I knew at that moment that I had discovered some important missing pieces. Five hundred Indian nations knew the pathway to the heart. They had a resonance to, and a reverence for, all of life and the unseen forces of the universe – a trust-based paradigm. As a mother in the 1980,s I knew I had to expose my children to this way of being in order to bring balanced humans to the playground of humanity’s evolution. 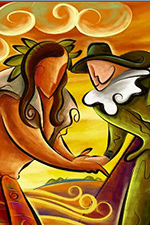 I began to take my children to hear Native American storytelling, and to witness Native American dances and ceremonies in Santa Fe and the nearby pueblos. The cosmology we experienced aligned with the ideas I had been resonating to. 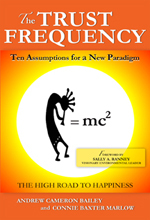 My journey to understanding the Trust Frequency began in 1988 with something I called “The Malaise.” My body said: “Stop the world, go inside.” I thought I had the world by the tail, and suddenly I couldn’t function. I had three young children and it seemed I was dying. Then it began. It became apparent that it was not my children’s education that led me to the Native Americans, it was my own destiny path. Visionary elders started coming into my life and became my friends. I created forums for them to share their extraordinary world-view through the 1990s in Aspen, Colorado, and I subsequently journeyed to the Hopi, the Maya, the Lakota, the Wabanaki, the Tarahumara, and the Ute with my children, and finally, after meeting Andrew, to the Kalahari Bushmen in Africa. This close association with these open-hearted elders, as well as personal experiences that brought me new information, lead to my deducing that there exists a frequency realm where the true nature of the Universe lives. I could tell intuitively when I was being shown a piece of Truth by the energies, and I would add the new piece to my evolving world-view. I have spent over two decades disseminating the understanding of the conscious loving Universe I had discovered: books, films, photography exhibits, ceremonies, lectures, performances. I was proposing ideas that even the visionary elders didn’t fully understand. It’s an evolutionary upward spiral. 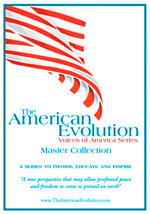 My insights were bringing and expanded articulation of the nature of the Universe. I thank Lakota Grandfather Wallace Black Elk for being my seeing-eye-dog into another reality, and for being a good friend for over fifteen years. I thank Ute elder Grandmother Bertha Grove and her son Alden Naranjo, for sharing wisdom and being my friends, Grandmother Kitty, Gram Twylah Nitsch, Marilyn Youngbird, Spiritwalker, and Larry Littlebird for giving me important clues and friendship, and beloved Penobscot elder Arnie Neptune, who shared his heart-felt understanding of the love that drives all things; my Hopi friends, Ernestine, Catherine, Ramona, Marcella and the others, and the Maya in the jungles of Chiapas, Mexico, Chan K’in Cuatro and family, Joseph Campbell for paving the way into indigenous cosmology, Henry David Thoreau for being a key bridge between the mystical and the practical. My children. Alison, Consi and Jonny joined me on the journey, often taking my hand and leading me into the unknown. Thank you! My ancestors, Mayflower Pilgrims William and Alice Mullins, Priscilla Mullins Alden and John Alden, and James Phinney Baxter and Percival P. Baxter for putting their lives and political careers on the line for the higher good of humanity. Finally I thank my parents Jack and Alice Baxter, who respected my divine autonomous sovereign being-ness from the outset and gave me the personal power and self-trust to TRUST THE LOVING UNIVERSE!